How is it possible that this baby is one? This is the little baby who has surprised us ever since she came into being just one week after our miscarriage. This is the 9 lb 13 oz baby who came into the world (without drugs!) after a “short” 17 hours of labor. This is the baby who we cuddled skin-to-skin as she fought a suspected lung infection during her first week in the NICU. This is the sweet baby who falls asleep easily, confidently explores on her own, laughs at our correction (Lord, help us! ), drools constantly, brings out the best in her sister, amazes us with her concentration, flexibility, and curiosity, and reminds us daily that being a parent to a little baby is a beautiful, wonderful thing. And although our girls’ birthdays are only six weeks apart (and a combined party would have been perfectly acceptable), we thought this first birthday deserved a celebration all its own. It’s been a spectacular first year of parenting our Baby Z! We made it! And that is cause for celebration. Okay, enough about us. You’re here for the party. You want birthday ideas! Without further ado, we invite you to our little one’s first birthday party! Like many of you, I love Etsy. The Etsy owners you’ll see mentioned in this post are all incredibly creative, friendly, and down-to-earth. They have helped by contributing materials and party decor. Please visit their shops, like them on facebook, and pin this post so that you can turn to them when you plan a party of your own! I refuse to admit that my baby really isn’t a baby anymore. To assist with my denial, I centered this party around things that remind me of childhood innocence and pure, simple fun: pinwheels. Giant spinning pinwheels as centerpieces. 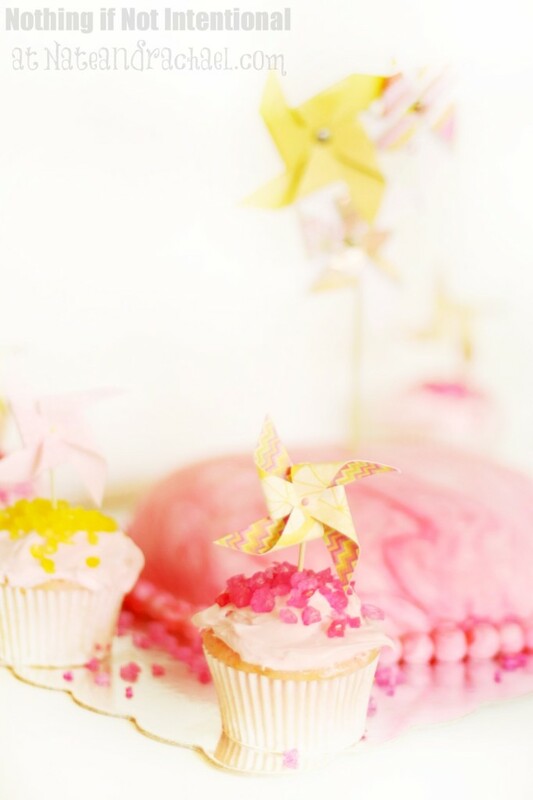 Pinwheels on cupcakes and the cake. And since it was a little girl’s first birthday party at the end of Indiana’s hot and humid July, pink lemonade seemed like a natural complement to the pinwheels. The chevron and polka dot favor bags and thank you tags helped to pull the ideas together. As did the banners and signs. 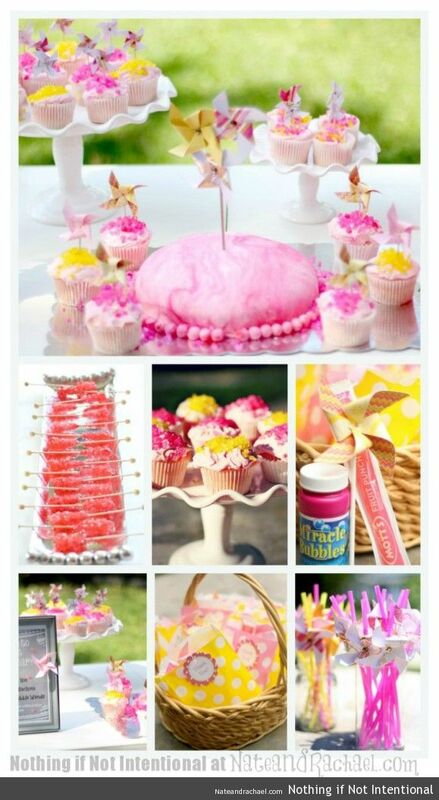 And the pink and yellow dessert bar. The rock candy cupcakes sprinkles and rock candy sticks were a total hit. I sought out Kathy from DK Delektables in part because I saw her shop offered rock candy sprinkles. They tasted amazing, and they made cupcake decorating super easy. 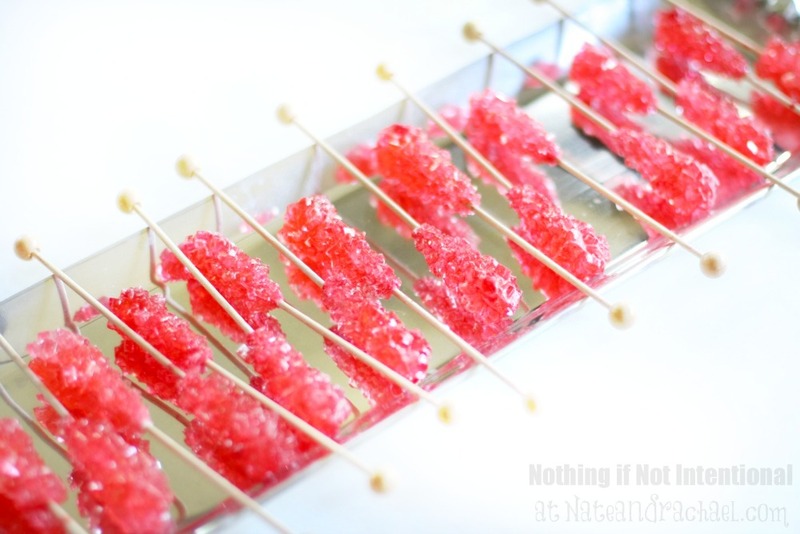 And although sugar isn’t a health food substitute, it was nice to be able to offer the rock candy sticks as an allergy-friendly dessert option. 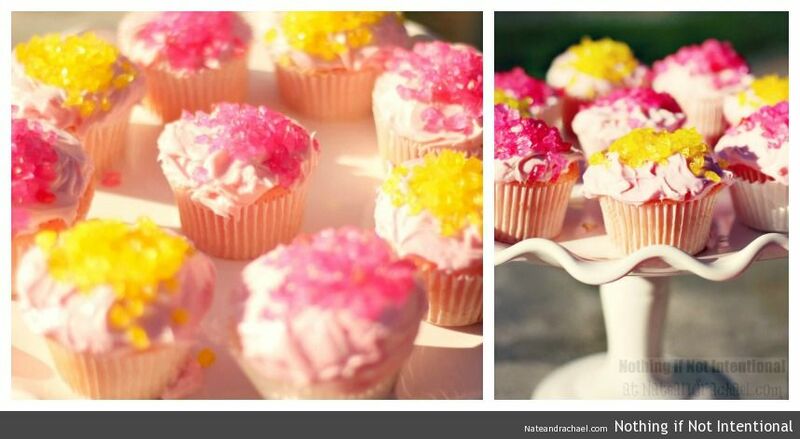 The rock candy cupcakes went well with our cake. 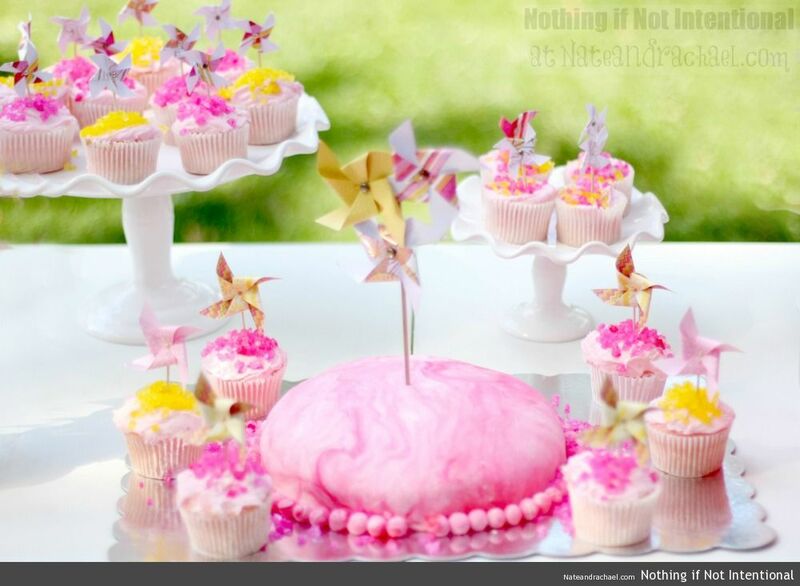 Pillsbury just came out with a new pink lemonade cake mix and icing set. Perfect! And Nate and I make our own marshmallow fondant–it’s easier than it sounds! Cake baking is one of shared hobbies–along with scuba diving, going to couple’s counseling, and picnics in the cemetery. You can read all about our favorite date ideas here. And while the decorations were beautiful, the star of the show was (in my biased opinion) this sweet little girl. Her dress was stunning. 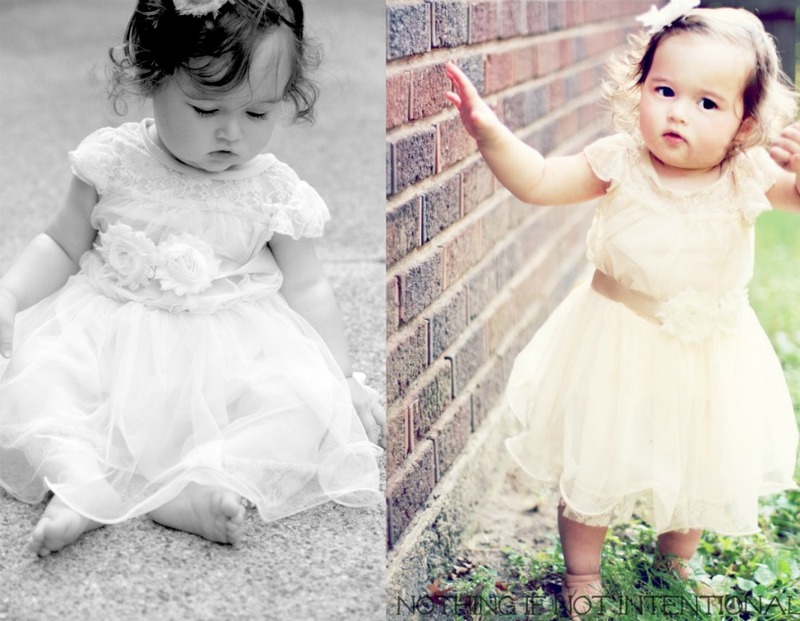 I’ve yet to see a more beautiful dress for a little girl. It would be perfect for a holiday or wedding as well. The “Favorite Things” poster was the perfect photo prop. 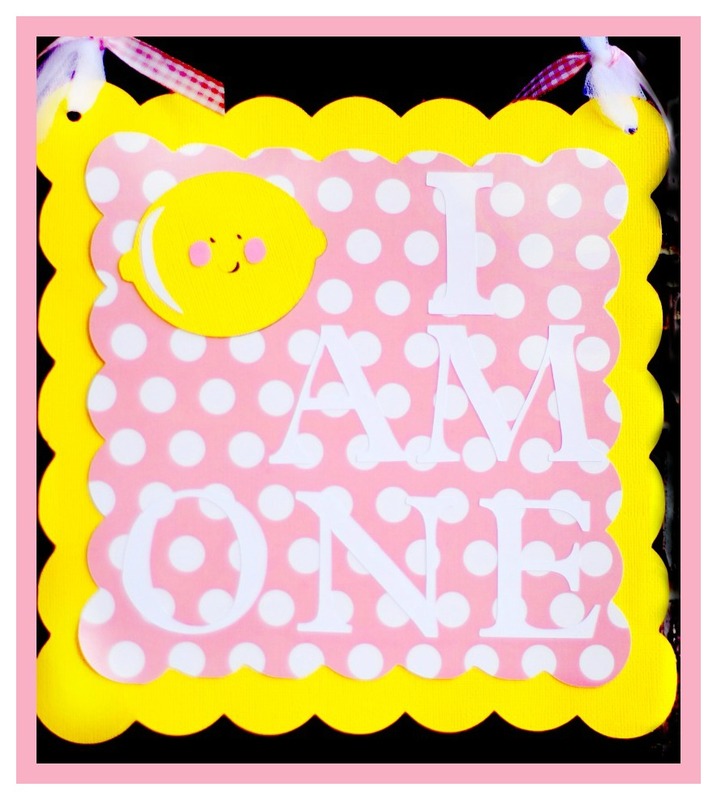 And what more could a one-year-old birthday girl want than to be surrounded by friends and family who love her dearly? 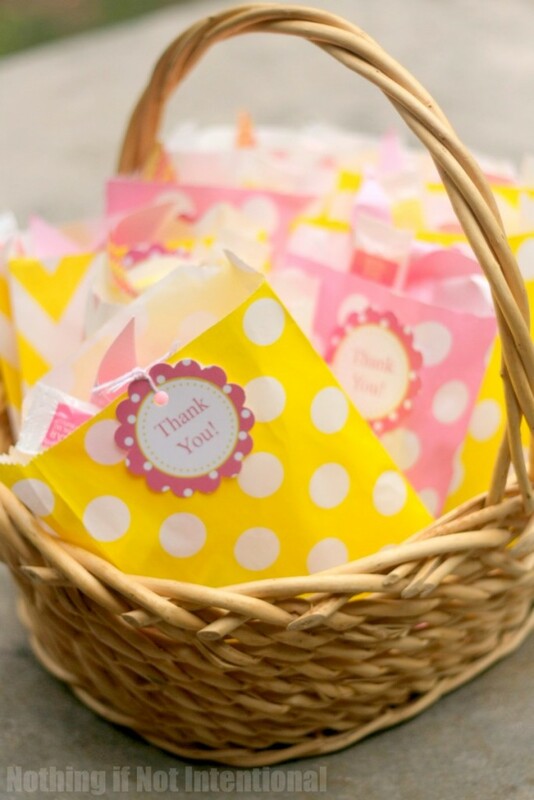 To thank her party guests for coming, we sent them home with these adorable favors. I wasn’t sure what to include in the favor bags. I couldn’t bring myself to send CANDY home with the babies. But I found these freezer pops at the dollar store! 10 cents each, 100% apple juice, and pink, yellow, and green. They were made for our treat bags! To tie the themes together, I also added bubbles and a pinwheel. Perfect, right? To see how we invited our little friends and their lovely parents, check out this post: DIY Birthday Invitations. It cost me $2.80 to design and print 30 invites! Since I’m a fan of sensory play, I wanted to come up with a few simple sensory play activities that would appeal to kids of all ages. A bubble bar was the perfect solution! 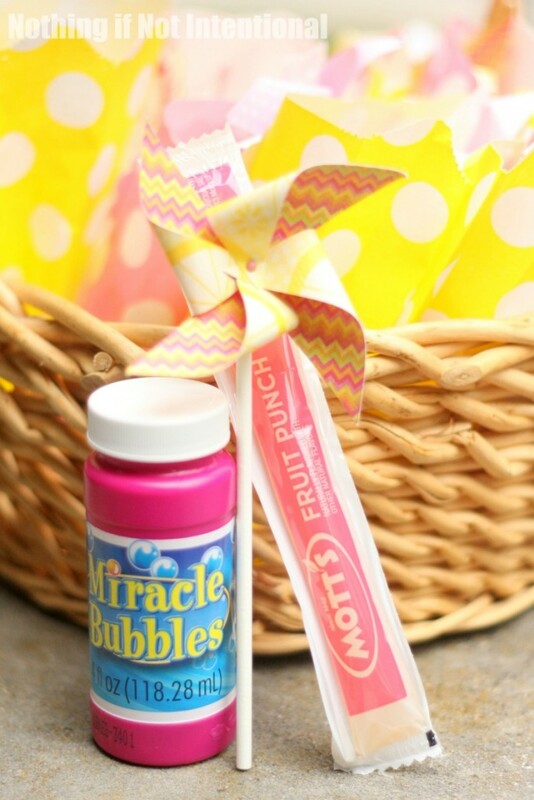 Read more about it here: Bubble Play for a Birthday Party. 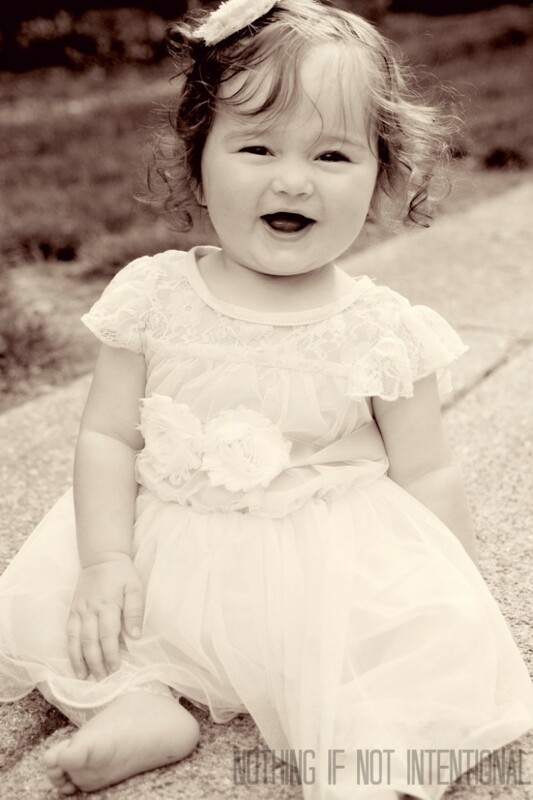 Our big girl turns THREE in just a few weeks! Pin with us on pinterest, join the conversation on our Nothing if Not Intentional facebook page, or subscribe to email updates so that you don’t miss new posts or details about her vintage airplane party. What can I say, her daddy’s a pilot. The girl loves planes! Please pin this post so that you and your friends can find our amazing birthday sponsors the next time you need to throw a party! DK Delektables–Rock candy sprinkles, favor bags, favor tags, straws, and banners. Kailyn Zoe and Company--Special occasion dresses. Moulage Collection–The ORIGINAL Favorite Things Poster. Frolicking Lark Designs–Giant spinning pinwheels, birthday pin, cupcake and cake toppers. 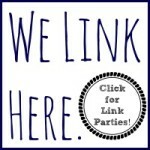 You can find a link to the complete party line here. 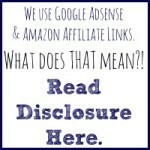 10% off using coupon code INTENTIONAL! 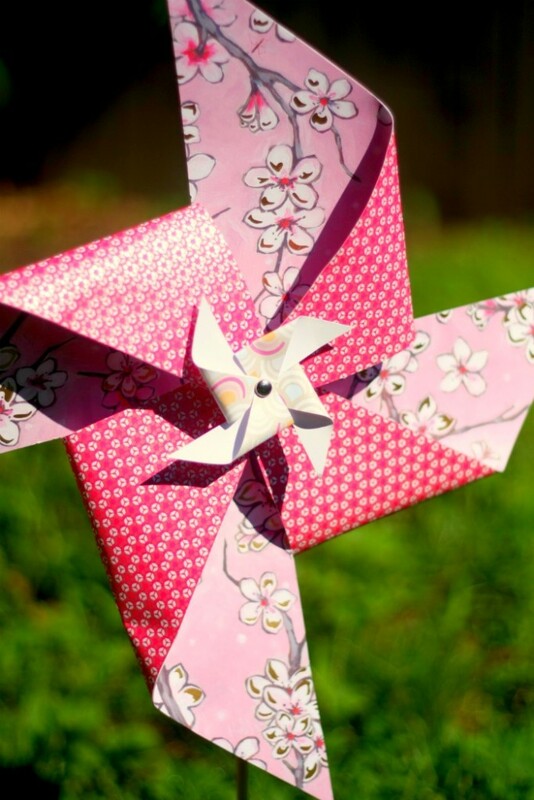 Earth Cookie Creations–Pinwheel favors, cupcake toppers, and decorations. ← Make Your Own Invitations–Easy and Adorable Tutorial! Swoon!! I just love all the little details! Aww, Shaunna, thank you! Your feedback means so much to me! 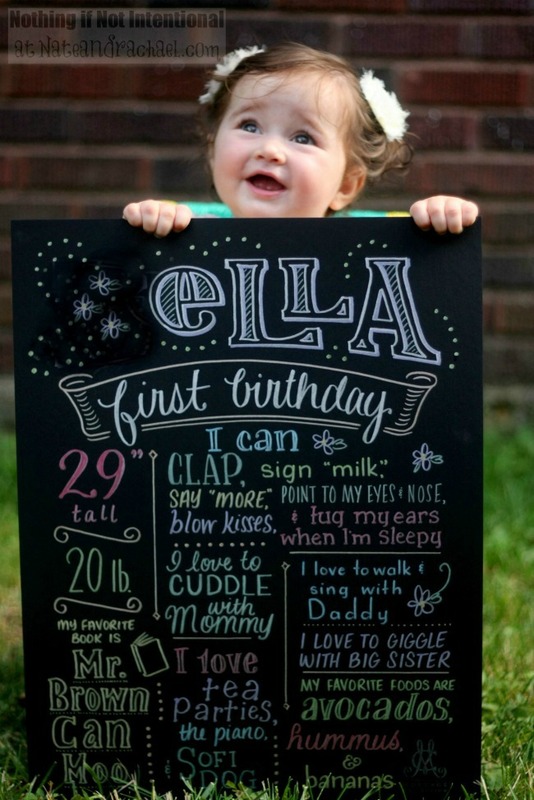 Pingback: Make Your Own Invitations--so cute, easy, and frugal! Such a great party theme! Thank you!! It was perfect for us. Thanks so much for taking the time to read and comment! Such a beautiful party for a beautiful little girl! 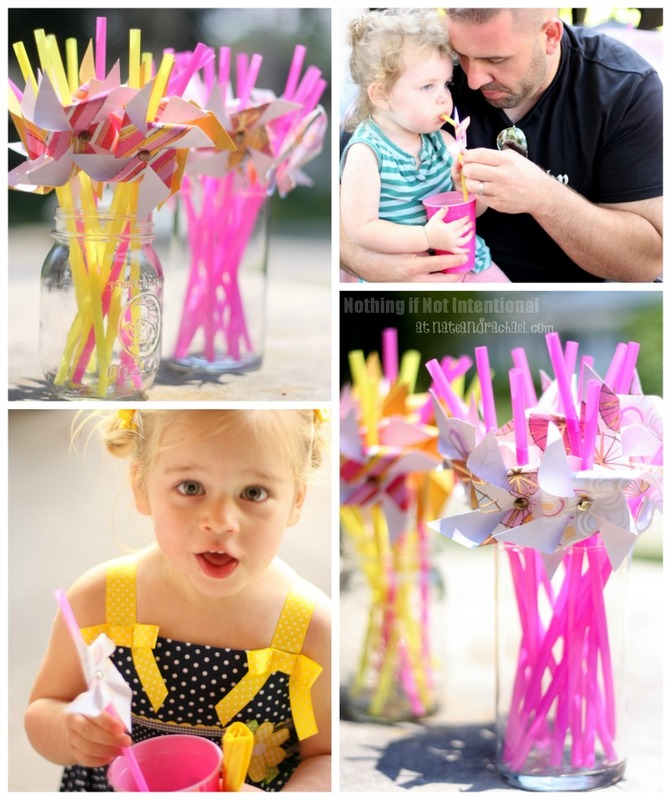 LOVE the idea of pink lemonade and pinwheels, too!! Thanks, Mary Catherine! Thank you for all of your feedback and your sweet compliments!! What a beautiful party! All the details are to die for. Honestly though, what I think I love most about this post is your heartfelt first paragraph. There is nothing more fulfilling (and challenging!) than parenting. This is really a great idea! Thanks for featuring my rock candy suckers!! You did a great job! Awww-thanks for reading the whole thing, Jessica! I wrote that to remember who and what we are celebrating–even though I figured most people would skip to the pictures. Your words are much appreciated and very encouraging!! Awwwwww! Such a sweet party! Hi…I found your post about “pink lemonade and pinwheels” through a series of posts and re-posts on Google +. The phrase fit in nicely with my writing for kids, so I hope you don’t mind that it inspired me to write my daily Rhyme Time using the party you gave her as the inspiration for 4 short verses. Keep up the creative work…lots of bright, colorful ideas. Pingback: Airplane birthday party ideas for your future pilot!